I order for a GOAL to be strongly established in your sub-conscious, it must first be written down. If you’re merely thinking about your goal, it’s not really a goal at all…only a DREAM. I write my goals in a small hardbound journal. Use what you feel is best for you. 1) What do you want? Write it down clearly and in complete detail. This is the “What” pertaining to your goals. 2) Make an “Action Plan” of everything you need to do to over the next few days, weeks, months get you closer to your goal. This is the “How”. 4) Why is this important to you? What would it mean to you? In order to be successful we must create a meaning for what we do. How would accomplishing these goals affect your life and your future? It is usually who we become while accomplishing our goals that is most important. This is the “Why”. 5) Take action toward your goal and begin immediately to do something to move you in the direction of your goal. What are you committed to do to take your first step forward? Direct 100% total commitment toward the accomplishment of your goal. Flexibility is absolutely crucial; if what you’re doing isn’t working, change your approach, if that doesn’t work, change your approach again until you succeed. Any person who wants to be successful in anything, regardless of what it is, he or she will fail far more times than they will succeed. Riding a bike, we all fell down far more times than we succeeded in staying up at first. Learning to walk, did you ever see a baby walk on his first try? Conversely, did you ever see a baby get so frustrated and angry because he didn’t walk perfectly that he quit? So frustrated that he gave up and never tried again because he hadn’t gotten it yet? Of course not! But have you ever seen non-babies do that? Not you personally, but maybe people you know? Many people value success, but they also want to avoid feelings of failure (or feeling like a failure). The problem comes when a person’s fear or avoidance of failing prevents him from taking action and trying, or going through the necessary repetition of trial and error that it takes to master something. Remember, we all move toward pleasure and away from pain. Some of us are driven more by moving toward pleasure, some more by away from pain. Many times people set goals that have very little to do with what they truly value in life, or they set goals that do not take into account what they want to avoid. Then they wonder why they aren’t following through, and label themselves as lazy or undisciplined, that’s rarely the case. Usually, the problem is that people’s goals have nothing to do with their value system or how they like to be reinforced. Here’s how! Get some leverage. Think of the goal or objective you wish to achieve, but have had difficulty completing. Make a clear picture of this goal in your head. Now, think of how great you would feel, when this goal was completed. Think of all the benefits you would gain and the feeling of total satisfaction knowing that you have accomplished this. Visualize yourself with a huge smile on your face, as you finish. Got that picture clear and complete in your mind’s eye. GOOD! Now, think of the negative emotions associated with not completing this same task. Think of the frustration you’ve experienced now and before as this goal once again slips away from your grasp. Think of how you will feel in the future as you embrace the loss of satisfaction and negative drain these emotions have, as you face the reality that you failed only because you have given up! Run these two mental videos over and over in your head. 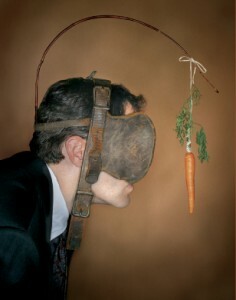 These visions are the carrot and the stick. Now, write “The Carrot and the Stick” on a small note pad and put the note somewhere conspicuous, somewhere you will see it daily for at least one week. When you see it run your mental video. In a short time you will begin to change your association to this goal and connect your emotional content via your values and the principle of pain and pleasure. I’ve had amazing results with this, and if you believe it, and try it, so will you. You’ll never get where you want to be by focusing on what you fear. Instead focus on where you want to be. Have a great new year and the best of success in your near future! Sifu Kevin Seaman has been involved in martial arts and martial athletics as a practitioner, competitor and trainer for nearly 40 years. He currently holds instructor rank certification in seven martial arts systems (2 in JKD), is a certified boxing coach and performance specialist, and has trained thousands of athletes. Look for his new book, The Mind Game Of MMA available now!